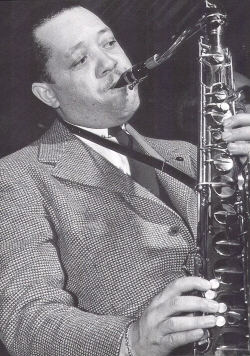 Lester (Willis) Young, known as “Pres,” was born in Woodville, Mississippi and died in New York City. Named Willis Lester at birth, he dropped “Willis” at an early age. Young developed a light tone and swinging style as a member of “territory bands,” such as the Oklahoma City Blue Devils, whose members gave him the nickname “Pres” short for President of the Tenor Saxophone — around 1932. By 1936 he played in Count Basie’s Kansas City band and became one of the leading tenor saxophonists of the swing era. Basie’s orchestra moved to New York City and Young performed and recorded not only with Basie, but also with most of the leading jazz musicians for three decades. Known mainly for his velocity and swinging style with Basie, in 1937 he recorded several ballads with singer Billie Holiday and pianist Teddy Wilson.